"The Box Gun evolved from my Nelspot barrel getting rusted out. I needed a new marker that had the same balance and feel as my Nelspot. I got a Duck receiver and blank barrel from Dave Loo and asked Earon Carter to machine the rest of the gun giving him some minor specifications: It had to have adjustable Millett sights, a ported barrel, a fixed top so the sights would be fixed to the barrel for accuracy, it had to look and feel like a 1911 .45 and it had to be accurate as hell. Needless to say Earon being the master machinist came up with the Box Gun. 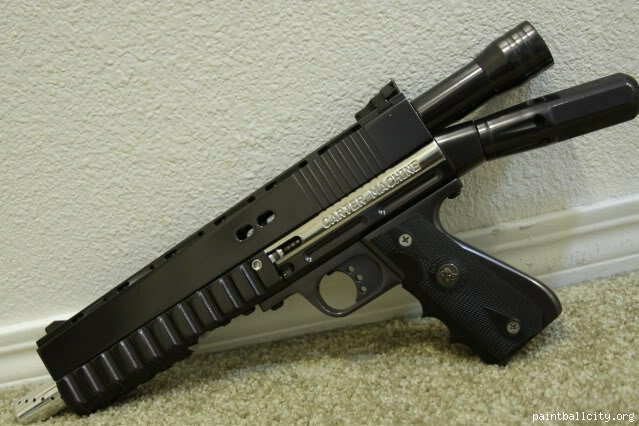 Glen Chon of Check It Products wanted to produce a production “Stock Class” pistol so my gun was used as the prototype for the existing Box Gun. That is why there are many similarities to the Desert Duck. Earon Carter and Dave Loo had a hand in designing those two guns."